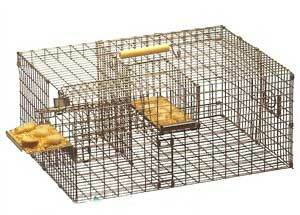 QUICK TIPS: There are two main kinds of traps: in-box traps and ground traps. Many bluebird landlords use both. Any traps require vigilant monitoring. Also see Trapping tips. NOTE: Prices DOchange over time - Prices shown are from 2015. Text last updated 01/2019. 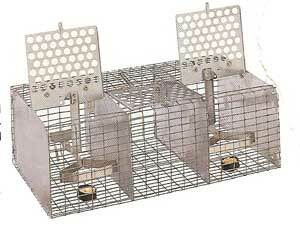 I. IN-BOX TRAPS : The following traps are mounted inside the nestbox when a HOSP has been seen either on or in the box. These are used during nesting season and must be carefully monitored. When the trap is placed in the box and set, the HOSP generally enters box and springs the trap within a few minutes. To further entice him/her, you can place a strand or two of long grass sticking out of the entrance hole (simulates another bird trying to use the box). 1. 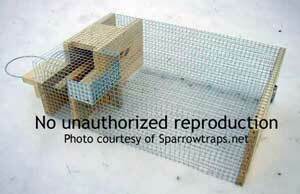 Universal Sparrow Trap (Van Ert) – Trap mounts onto inside of box with two small screws. Once screws are in box, they can remain and trap can easily be removed and reinstalled as needed (just slips on over the screws). Trap is spring loaded, metal construction and fits in just about any box. This is my favorite in-box trap. You can order directly from Van Ert Enterprises for $9 at: http://www.vanerttraps.com/ . If you are using a Gilbertson PVC nestbox, Van Ert makes a trap (same price) for this box as well. Comments from Bet: Well made and reliable. Lightweight and sturdy. Easily slips on and off of screws. Virtually impossible for trapped bird to escape.He also makes a trap for Wood Duck boxes. My personal favorite inbox trap. 2. Huber Trap– This is a good trap as well and can be built into the box if you like. Plans can be found at: http:// audubon-omaha.org/bbbox/nestbox/ huber.htm. I found them available at the Purple Martin Conservation Association for $11.95 (14.95 if made from recycled plastic.) I have one of these traps, but it does not fit well in all of my boxes. Comments from Bet: Reliable, but too heavy, hard to move from one box to the next, does not work with front opening boxes, does not fit in all boxes, tends to trip when it is really windy out. May be better for a wary male scared off by the V-shaped trigger on a Van Ert. 4. Gilbertson Trap – This trap works on any style box and has a small piece of metal measuring tape that springs shut to close off the hole to the box and trap the HOSP. Steve Gilbertson no longer manufactures bluebird products, but you can get this style trap from the Purple Martin Conservation Association for $13.95 +S&H. Comments from Bet: Not as sturdy as the Van Ert traps. Have heard occasionally of a bird squeaking past it, and had a chickadee get caught in the trigger mechanism, but still the best option for a round PVC (Gilbertson) style box. 5. Peterson Trap – This trap works in Peterson nestbox only. NO LONGER AVAILABLE. This trap was from Ahlgren Construction of Stillwater MN, which is no longer in operation, as Dave passed away in 2007. (Note: It sold for $5.50 per trap plus $3 S&H, $1 more for each additional trap). A VanErt trap works fine in a Peterson box - see #1. II. GROUND (CAGE) BAITED TRAPS: The following traps are usually placed on the ground and baited with white bread, millet seed, feathers or other items that attract HOSP. 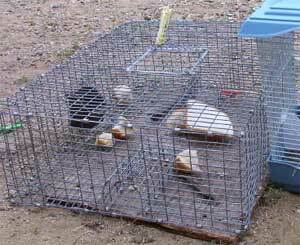 Most of these traps work best when “decoy” HOSP are kept in the trap to entice other birds. Therefore, a source of water and food is required at all times. Some of these traps can be mounted on poles. Comment from Bet on photo of trap with bird cage: When using any ground trap, I often keep HOSP decoys (which help lure in birds) in a separate cage to protect them from the elements and any other aggressive HOSP that are trapped. It is also easier to feed and water them, and to put them inside a garage at night (to protect them from raccoons etc.) In addition, I don't have to worry about them escaping when other birds are removed from the trap. I actually catch a lot when I put the trap on top of the bird cage with a male and female inside. However, some of these traps are too small for decoys. See more trapping tips. Brad Biddle funnel trap - no longer made. 1. Deluxe Repeating Sparrow Trap (DRST)- This trap was designed and built by Blaine Johnson and can be seen and purchased at: http://www.sparrowtraps.net/ for $59.95 + shipping based on location. It is a true repeating HOSP trap that is well designed and works very well. This is my favorite bait trap for HOSP. HOSP are kept in the trapping chamber as decoys and I have never had one find their way out once they are trapped. I believe the trap works best slightly elevated such as on a picnic table or deck railing. Small plastic food cups used for caged pet birds can be hooked onto the wire inside the trap to provide the decoys with fresh food and water. Although a bit small, this trap is also effective for trapping European Starlings (EUST) during winter months, with some slight adjustments to the weights on the elevator arm. (A HOSP weighs about 0.85-1.4 ounces, a Common Starling weighs about 2-3.6 ounces. When testing the trap for HOSP, you use 2 quarters on the elevator and it should go down and bounce back up. 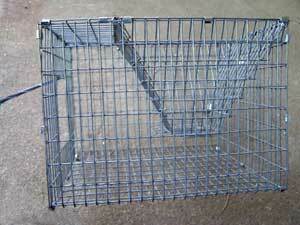 Try 3 or 4 quarters for trapping starlings.) For starlings, use fresh peanutbutter suet for bait and always check frequently for non-target captures! Comments from Bet: Also my personal favorite. This sturdy, medium-sized trap works well because the bird pursuing food is committed once it steps in the elevator, which is weighted specifically for HOSP. Also, the main holding chamber they then go into is virtually escape proof. Of the hundreds of birds I have caught in the first trap I got, only two got out somehow, but the designer has made a number of improvements to the design since then. The only problem I have with it is that my arm is too short to reach all the way into the back of the trap for removing birds. The wooden arm is waterproofed on the new traps, but may need readjustment after a heavy rain due to swelling. It has a large removal door with a clever baffle to prevent escapes while retrieving captured birds. I added a handle for carrying. If I only had one ground trap, I would choose this one. Reasonably priced. Also see Cedar Valley Repeating Trap. 2. Cedar Valley Ground Trap (formerly made by Afton Cedar Works) - NO LONGER AVAILABLE. See DRST. This repeating elevator sparrow trap was about $70 + $10 shipping. Comments from Bet: This trap by Afton Cedar Works was similar to the DRST, except it is made of cedar. It has a square door to one side of the trap which makes removing birds somewhat more difficult than the round, centered door on the DRST. The door is covered with a rubber flap that lets you open the door without the possibility of the bird escaping before you put your arm in. There is a wire mesh "wall" in the chamber that forces the bird to enter the trap holding area, and makes it nearly impossible for them to leave. There are also two vertical wooden strips, one on either side of the trap door, that prohibit the bird from getting it's beak under the edge of the trap door, no matter what position the bird is in relative to the door. Comments from Bet: Not a repeating trap - i.e., catches only one bird at a time. Will also trap small mammals. Good choice if you are concerned about multiple trapped birds/creatures hurting each other. 3. ST1 – Wire Sparrow Trap - now called the Songbird Essentials Wire Sparrow Trap SEST1– This trap has two trapping chambers that flank a central holding chamber. It is available for $57.95 + shipping from the Purple Martin Conservation Association. Comments from Bet: One of the only traps I have not tried. Not a repeating trap. Does separate birds so they can't kill each other. Very small holding area. 4. 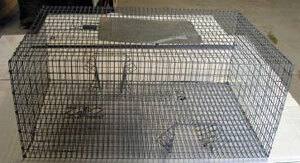 PMCA Repeating Bait Trap: (Available from the Purple Martin Conservation Association for $65.95 plus shipping. Comments from Bet: Adjustable elevator, sturdy. Large door that birds can fly through if you're not careful when removing birds/changing food and water. Door edges are sharp and can cause scratches. Small birds are sometimes able to escape. Have caught a bunch of starlings in this trap, along with red squirrels and chipmunks. Chipmunks also yank out the bait tray, so it must be wired in. The platform fell off, and needs to have a chunk of wood placed under it. Sometimes elevator sticks to bottom of cage - I've put a piece of plastic there so it doesn't get hung up. Lightweight, easy to move around. 5. Kness "Kage-All" Funnel Trap: Comments from Bet: I have not tested this trap. It is 18 3/4" x 12 3/8 x 8 3/8", and has two funnel entrances, and a door on top, and is made of heavy gauge steel, and weighs 7 lbs. It retails for about $60. They also make a larger pigeon trap with one funnel. Sold at Kness.com and other places. 6. Brad Biddle’s Ground Trap - NO LONGER AVAILABLE. This trap was available for purchase for $30 + shipping. I built a trap like this one and have had limited success with it. I have had “decoy” HOSP find their way out again and personally have problems leaving any bird in a trap for an extended period as they show signs of distress. The trap also catches a lot of juncos and chipping sparrows which I release immediately. See plans to make the Biddle trap, courtesy of Brad Biddle. Comments from Bet: Before I bought the DRST, I caught the most HOSP in this trap. It was a funnel trap with holes that taper, and"gates" around the two entrances, making it harder for birds to get out, and a large door up top. It does catch a lot of native birds. Biddle no longer makes this trap. 7. Jenkins Trap: Comments from Bet: NO LONGER AVAILABLE. This small, sturdy, lightweight and inexpensive funnel trap was available on Ebay from Bruce Jenkins for about $23 + 7.50 postpaid. It has a funnel on top and a door which is held closed with a little piece of plastic wire. Jenkins indicates thousands have been sold to individuals, Wal-Mart Stores and Tyson Foods. Mine came without any instructions. I had birds escape from the old version and the new version. Jenkins recently modified the trap to add a little movable "floor" at the end of the funnel that drops the bird into the bottom of the trap and is designed to prevent escape. To test it, I placed a male HOSP inside. It escaped in less than 15 minutes (fortunately I did this test indoors.) Two other males escaped within 30 minutes when the trap door got stuck on the bottom of the cage as they fluttered about. A juvenile escaped even when the trap door was wired shut. When side by side with a Biddle trap (no longer made) or a DRST, so far I have only caught sparrows in the DRST and Biddle traps. The edges around the door are sharp and the configuration makes it somewhat difficult to feed and water detainees, or to remove a non-target creature. In my opinion, the trap is too small to hold a number of birds for any length of time (they tend to get aggressive or stressed in small spaces.) (Jenkins recommends the following to empty the trap: suspend it from a swing set, tree limb, deck rail… and spin it until the birds “faint.” Pull them through the release door.) He also sells a starling trap. III. Dealing with Trapped Birds : After you have trapped your HOSP, you may humanely euthanize the bird. Releasing it elsewhere is not a good idea as the HOSP may beat you home. NABS has excellent educational materials regarding HOSP control. Another good website that discusses HOSP management (and links to even more traps!) is: http://www.sialis.org/hosp.htm. Another webpage discusses how to actually euthanize the HOSP and can be found at: http://www.sialis.org/hospdispatch.htm. Comments from Bet: All of these traps are "live" traps in that the trap does not kill the bird. Wing trimming is an alternative to euthanasia. It does not permanently remove HOSP from the breeding population. Last updated January 7, 2019. Design by Chimalis.